Both infrastructure inspections and the available tools (or sensors) to inspect complex capital equipment are becoming more sophisticated. Today, customers either use manned helicopters or foot based personnel for many asset and infrastructure inspection tasks. The challenge is being able to repeat the inspection process safely, accurately, time after time and establish trend data delivering higher quality inspection information, whilst reducing the overall inspection task budget. Not only do businesses need to drive down costs, but often the demands on today's networks means that inspection times need to be reduced whilst inspection frequency is having to be increased. The ability to inspect network based infrastructure more accurately, more consistently and at lower cost whilst reducing the need for manual inspection data post-processing is becoming a strategic objective. Today's techniques (manned helicopters and foot patrols) are becoming expensive and often lack the required level of repeatability that opens doors to advanced data-processing technologies and trend data analysis. Companies have started to use next generation technologies including "drones" operating Within Visual Line Of Sight [WVLOS], (which have endurance, precision flight and range limitations). To achieve the end goal of fully automated inspection processes is going to require a step change in "drone" or Remotely Piloted Aircraft System [RPAS] architecture. The unique capabilities of the VTOL Technologies VTOL Flying Wing start with an advanced flying-wing aerofoil that is able to provide high lift at low speeds, whilst providing low drag at high speed. Coupled with this are four ducted-fan rotors that are able to rotate as pairs. Each ducted-fan pair being able to rotate through 110 degrees from the horizontal through to the vertical. Such a capability enables the aircraft to both accelerate and decelerate very rapidly indeed to and from the hover. Each ducted-fan propulsion unit is individually controllable. 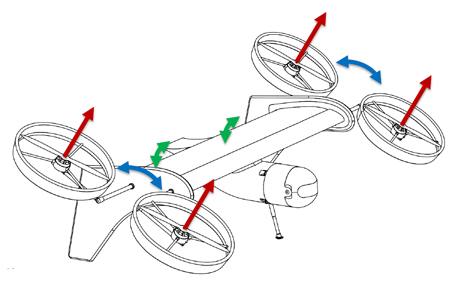 Such a degree of control authority creates a highly manoeuvrable aerial platform that can hover into wind (dramatically reducing hover power consumption) as well as being able to take off vertically from a moving ground based vehicle or maritime platform. In addition to thrust vectoring control, the airframe also incorporates flapperons, both increasing aerofoil based lift at low forward speeds as well as providing aileron and elevator control authority for standard aircraft flight manoeuvres at speed. Three critical technologies need to be incorporated in a new, long-endurance, precision-flight, flexible and "deployable anywhere" "drone" or RPAS platform. This new breakthrough platform is VTOL Technologies VTOL Flying Wing. The three critical technologies are being combined with this unique airframe are high-accuracy GNSS [Global Navigation Satellite System], both short-range and medium-range, miniaturised collision-avoidance systems and persistent Beyond Visual Line Of Sight [BVLOS] communications technologies. The VTOL Flying Wing provides a cost effective, automated BVLOS, long-endurance sensor platform for network-based industries in the fields of energy distribution, transportation, logistics and agriculture for the aerial inspection of infrastructure and assets and rapid transportation / logistics distribution of high-value packages. This system can be deployed almost anywhere, from land or sea, (even from moving vehicles or ships), to provide a precision-flight, repeatable, network-based asset and infrastructure inspection capability delivering higher accuracy, greater levels of consistently, at lower cost than current methods and emerging "drone" technologies, whilst reducing the need for inspection data post-processing.